As you know that when System Integrity Protection is active, and the new Spotify V1.0.87 or Above, Macsome Spotify Audio Converter Platinum can only convert audio files with 1X conversion speed under Spotify V1.0.87 or Above. In order to convert with 5x conversion speed, MacOS users need to turn SIP off. You can follow the next guide to know how to turn SIP off. Before you do this, it is important to get informed about "What is SIP". As we all know that we can make different types of user accounts on our Mac OS powered PCs, like Admin user, Standard user, and a guest user. Besides these, some accounts are already there by default which are usually hidden. One of these is root user or superuser. Prior to El Capitan, root user was awarded unrestricted status to change the system files which are usually not accessible by other normal accounts. In SIP, the root user is also restricted to modify the protected parts of the Mac operating system. Most of the apps don't need the access to those SIP protected files. But, there are certain third-party apps which don't run properly or crash upon launching when SIP is enabled on the PC. It happens because they can't get access to the needed files present in the restricted directories. Step 2: Turn it on but hold down the "Command + R" keys on the keyboard as soon as you hear the startup chime. You can leave the keys when you see Apple logo. 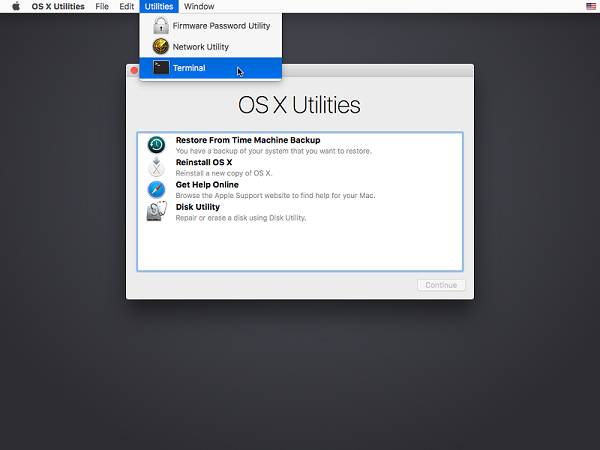 Step 3: When the macOS Utilities menu appears, left-click the “Utilities” and then click the "Terminal". Step 4: In the window that opens, type "csrutil enable --without kext" and press return. This turns off the part of SIP that Spotify Audio Converter needs to run, and OS X complains that it is an unsupported configuration. Step 5: Now write "reboot" to restart your Mac computer. After adjusting the above settings, you will be able to install and run Spotify Audio Converter Platinum to convert Audio files with up to 5X conversion speed under Spotify V1.0.87 or Above. Need to enable System Integrity Protection again, refer to the guide. We want to hear from you. We welcome your comments, suggestions and requests for information. Please use the email addresses below to contact us on any question.